A B M P m e m b e r s e a r n F R E E C E a t w w w. a b m p . c o m / c e b y r e a d i n g M a s s a g e & B o d y w o r k m a g a z i n e 23 NEWS NOTES compiled by Brandon Twyford Editor, Online and Digital Strategy | brandon@abmp.com ABMP AND ASCP WIN AT THE EXCEL AWARDS Association Media & Publishing (A M&P) announced the winners of the 38th Annual EXCEL Awards June 25 in Washington, DC. Among the winners were Associated Bodywork & Massage Professionals (ABMP) and Associated Skin Care Professionals (ASCP). The EXCEL Awards recognize the best and the brightest in association media and publishing. ABMP and ASCP were recognized for: Gold award: Media Kit, ASCP Silver award: Single Topic Issue: Massage & Bodywork July/August 2017 (HIV and AIDS) Bronze award: General Excellence (across three issues): Massage & Bodywork Design Excellence (across three issues): Massage & Bodywork According to A M&P, "The EXCEL Award winners were chosen for taking bold chances in editorial, design, advertising and marketing, online publishing, and electronic newsletter categories." Says Michael Marchesano, A M&P executive director, "We are privileged to recognize outstanding work in the association media and publishing industry this year. The EXCEL Awards showcase and spotlight first-class association content that's both innovative and enlightening in a rapidly changing world." MORE HOTELS AND SPAS ARE TRAINING STAFF IN MASSAGE FOR CANCER PATIENTS The New York Times (NYT) reports that several hundred spas and hotels around the world are increasingly catering their spa treatments to clients with cancer. According to the article, "The biggest change is in hotel spas where therapists are getting training in the needs and restrictions of cancer-afflicted guests when it comes to massages, facials, and manicures." Wellness for Cancer, a nonprofit organization led by Julie Bach, educates spas on how to provide wellness services to clients with cancer, including training spa therapists in how to modify and perform services. 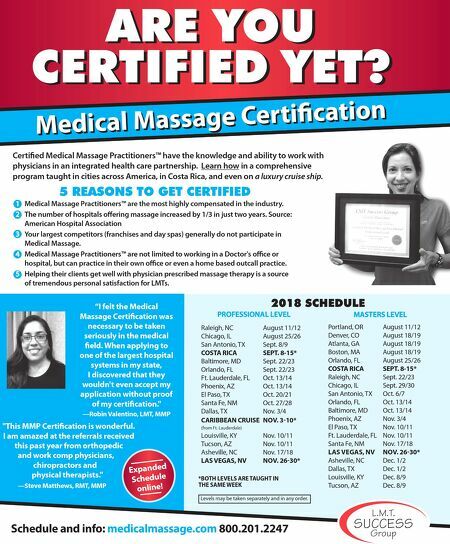 The NYT reports, "Wellness for Cancer has trained staff at more than 200 hotel spas since it introduced the training in 2012, according to Ms. Bach. The list includes small boutique properties such as Farmhouse Inn & Spa in Sonoma, California, and large ones that are part of well-known brands like the Four Seasons, at locations in Hong Kong and Surfside, Florida." For more information, including additional examples of the ways hotels and spas are striving to make wellness treatments accessible to all, read the full article at www.nytimes.com/2018/07/17/travel/hotels-resorts-cancer-spas-food.html. ISPA RECOGNIZES 2018 INNOVATE AWARD WINNERS The International SPA Association (ISPA) announced the winners of the 5th annual ISPA Innovate Awards, which celebrate creative solutions and products that continue to launch the spa industry forward. ISPA members determined the winners by voting for their favorites among a lengthy list of 80 Innovate applications. All award recipients will be recognized at the 2018 ISPA Conference & Expo at the Phoenix Convention Center in Phoenix, Arizona, September 24–26. "Constant innovation is the nature of the spa industry," said ISPA President Lynne McNees. 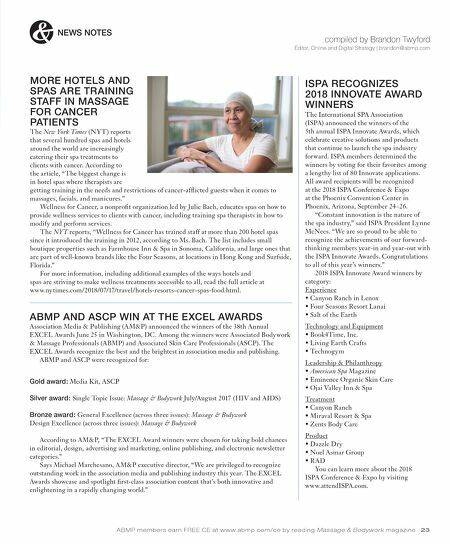 "We are so proud to be able to recognize the achievements of our forward- thinking members year-in and year-out with the ISPA Innovate Awards. Congratulations to all of this year's winners." 2018 ISPA Innovate Award winners by category: Experience • Canyon Ranch in Lenox • Four Seasons Resort Lanai • Salt of the Earth Technology and Equipment • Book4Time, Inc. • Living Earth Crafts • Technogym Leadership & Philanthropy • American Spa Magazine • Eminence Organic Skin Care • Ojai Valley Inn & Spa Treatment • Canyon Ranch • Miraval Resort & Spa • Zents Body Care Product • Dazzle Dry • Noel Asmar Group • RAD You can learn more about the 2018 ISPA Conference & Expo by visiting www.attendISPA.com.